This montage uses parts of a single montage at the Toledo Museum of Art. 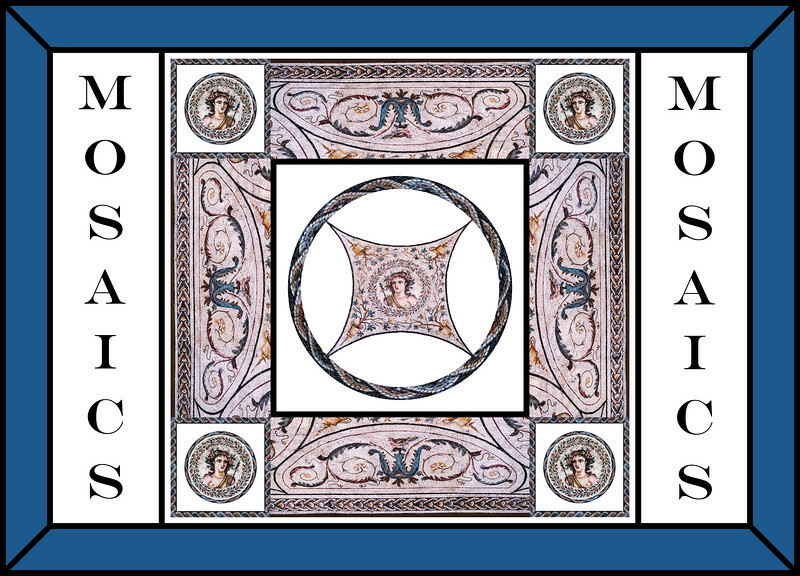 It is described in the accompanying information card as “Mosaic with Imago Clipeata (Framed Portrait) of Bacchus”. It dates to 140-160 CE, and is from the Roman province of Africa (modern Tunisia) Because it is a floor mosaic and quite large, it is impossible to photograph any but small bits of it around the edges from directly above. I decided to perform perspective corrections on individual parts and reassemble them into a facsimile (with artistic license) of the overall piece. The individual photos and the montage itself (created in August 2018) are copyrighted by Elizabeth Jean Jacob, with all rights reserved.